ELEVATE PRESENTATION How can we acquire study skills from the Elevate workshop that we can apply to our English classes throughout high school? Vacation HW: DUE MONDAY, APRIL 29th (before midnight): You are to read "Why it is Ridiculous Not to Teach Shakespeare in School". From the article, identify THREE reasons why teachers SHOULD teach Shakespeare in schools today. In addition you will WRITE A RESPONSE in a WELL-DEVELOPED PARAGRAPH (10-12 sentences) in which YOU respond to and take a side on the issue of teaching Shakespeare in schools. Basically, answer this question: Should Shakespeare be taught in schools today? You should use your own experience reading Romeo and Juliet, your knowledge on the plot, its characters, and themes, or any influence you think it has had on others. Today's Agenda How do Friar Laurence and the Nurse advise Romeo in Act III, Scene 3 in Romeo and Juliet? Vacation HW: DUE MONDAY, APRIL 29th (before midnight): You are to read "Why it is Ridiculous Not to Teach Shakespeare in School". From the article, identify THREE reasons why teachers SHOULD teach Shakespeare in schools today. In addition you will WRITE A RESPONSE in a WELL-DEVELOPED PARAGRAPH (10-12 sentences) in which YOU respond to and take a side on the issue of teaching Shakespeare in schools. Basically, answer this question: Should Shakespeare be taught in schools today? You should use your own experience reading Romeo and Juliet, your knowledge on the plot, its characters, and themes, or any influence you think it has had on others. ***Turn in all owed HW (today is the last day to turn in all owed work). How do Romeo and Juliet deal with the consequences of their actions in Act 3, Scene 2? Vacation HW: DUE MONDAY, APRIL 29th (before midnight): You are to read "Why it is Ridiculous Not to Teach Shakespeare in School". From the article, identify THREE reasons why teachers SHOULD teach Shakespeare in schools today. In addition you will WRITE A RESPONSE in a WELL-DEVELOPED PARAGRAPH (10-12 sentences) in which YOU respond to and take a side on the issue of teaching Shakespeare in schools. Basically, answer this question: Should Shakespeare be taught in schools today? You should use your own experience reading Romeo and Juliet, your knowledge on the plot, its characters, and themes, or any influence you think it has had on others. ***Turn in HW: Newspaper Article on Mercutio or Tybalt How can we expand our vocabulary knowledge through context clues and sentence completion? MAKE UP OWED HOMEWORK BY TOMORROW, TUESDAY (the last day of the 2nd marking period! No work will be accepted after your class period TOMORROW, Tuesday, April 16th!!! ): see previous days' assignments. Newspaper Article on Mercutio OR Tybalt: identify the 5 Ws and 1 H (who, what, when, where, why and how) about the murder of Mercutio OR Tybalt Then, in a well-developed paragraph (10-12 sentences) that follows the news article format (use the article we read in class as a guide: "Binghamton University Student Pleads Not Guilty to Murder in Freshman's Stabbing Death"), you will write your very own news article about the murder of Mercutio OR Tybalt. Try to be as creative as possible! Give your article a catchy headline that draws readers in, come up with a name for your newspaper (ex. The New York Times, Daily News, Wall Street Journal, etc.). This will be worth TWO homework assignments. MAKE UP OWED HOMEWORK BY THIS TUESDAY (the last day of the 2nd marking period! No work will be accepted after your class period on Tuesday, April 16th!!! ): see previous days' assignments. SECOND CHARACTER ENTRY FOR ACT 2: Write from one of the perspectives of ONE of the main characters (Romeo, Juliet, Tybalt, Lord Capulet/Montague, Lady Capulet/Montague, Paris, Benvolio, Mercutio, or the Nurse). See Character Diary Assignment Instructions. DURING CLASS (or e-mailed in advance to hconn@schools.nyc.gov or Ms. Conn through jupitergrades.com), you will turn in ONE entry for Act 2, which includes the following: a description of the character's unique traits (such as rank, social position, personality, and temperament). How does this character think, feel, act, believe and speak? Show how the character grows and changes during this act. You MUST include at least one quote in this entry. This should be two paragraphs OR one well-developed paragraph of 10-12 sentences. MAKE UP OWED HOMEWORK: see previous days' assignments. EXAM on ACTS 1 AND 2 in ROMEO AND JULIET. Study all class handouts/HW/class notes. The Exam will have 20 multiple-choice questions. You will not use the book or your notes for the exam. It will be worth around 30% of the 2nd marking period. Today's Agenda How can we analyze the actions of minor characters playing major roles in the events of the play? MAKE UP OWED HOMEWORK: see previous days' assignments. If we finish the exam early, we may continue here: Today's Agenda How can we apply our reading comprehension skills in the Midterm Assessment? MAKE UP OWED HOMEWORK: see previous days' assignments. It's a reading comprehension, multiple-choice exam. You do not need to study for this exam. You should remember to do the following on this exam: underline the line numbers in the reading passages, circle key words in the questions, annotate each paragraph of the reading passages, cover up the answer choices in the questions and write your own answer in the margin, practice process of elimination, and do not leave any answer blank. ELEVATE PRESENTATION How can we analyze how the actions of minor characters playing a major role in the events of the play? MAKE UP OWED HOMEWORK: see previous days' assignments. Today's Agenda How can we analyze the actions of both Romeo and the friar in Act II, Scene III ? MAKE UP OWED HOMEWORK: see previous days' assignments. Today's Agenda How can we analyze the actions of both Romeo and Juliet to understand Act II, Scene II? MAKE UP OWED HOMEWORK: see previous days' assignments. Today's Agenda How can we analyze Romeo's actions as well as those of his friends in the beginning of Act II? MAKE UP OWED HOMEWORK: see previous days' assignments. FIRST CHARACTER ENTRY FOR ACT 1: Write from one of the perspectives of ONE of the main characters (Romeo, Juliet, Tybalt, Lord Capulet/Montague, Lady Capulet/Montague, Paris, Benvolio, Mercutio, or the Nurse). See Character Diary Assignment Instructions. DURING CLASS (or e-mailed in advance to hconn@schools.nyc.gov or Ms. Conn through jupitergrades.com), you will turn in ONE entry for Act 1, which includes the following: a description of the character's unique traits (such as rank, social position, personality, and temperament). How does this character think, feel, act, believe and speak? Show how the character grows and changes during this act. You MUST include at least one quote in this entry. This should be a well-developed paragraph of 10-12 sentences. FIRST CHARACTER ENTRY FOR ACT 1: Write from one of the perspectives of the main characters (Romeo, Juliet, Tybalt, Lord Capulet/Montague, Lady Capulet/Montague, Paris, Benvolio, Mercutio, or the Nurse). See Character Diary Assignment Instructions. You will turn in ONE entry for Act 1, which includes the following: a description of the character's unique traits (such as rank, social position, personality, and temperament). How does this character think, feel, act, believe and speak? Show how the character grows and changes during this act. You MUST include at least one quote in this entry. This should be a well-developed paragraph of 10-12 sentences. Finish for classwork today and turn in Questions on Act 1, Scene 5 in Romeo and Juliet How can we analyze the significance of Romeo attending the Capulet party as well as his first encounter with Juliet in Act 1, Scene 5 of Romeo and Juliet? MAKE UP OWED HOMEWORK: see previous days' assignments. Finish for classwork today and turn in Questions on Act 1, Scenes 4 and 5 in Romeo and Juliet How can we analyze the significance of the characters' choices in Act 1, Scenes 4 and 5 of Romeo and Juliet? MAKE UP OWED HOMEWORK: see previous days' assignments. 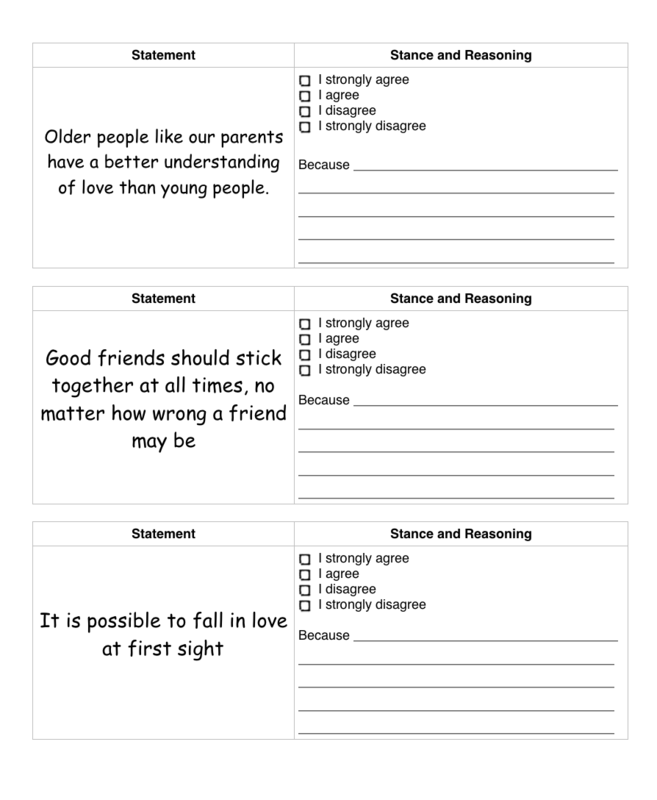 VOCABULARY FLASHCARDS for Romeo and Juliet List #1: Compose flashcards for all of the vocabulary words on Romeo and Juliet List #1. Create the flashcards on index cards, loose leaf or an electronic device. Write the vocabulary word and part of speech (noun, verb, adjective or adverb) on the front of the card. Write the definition and an original sentence (write your own sentence; don't copy from the sample sentences provided in class). *You may use an electronic flashcard app. 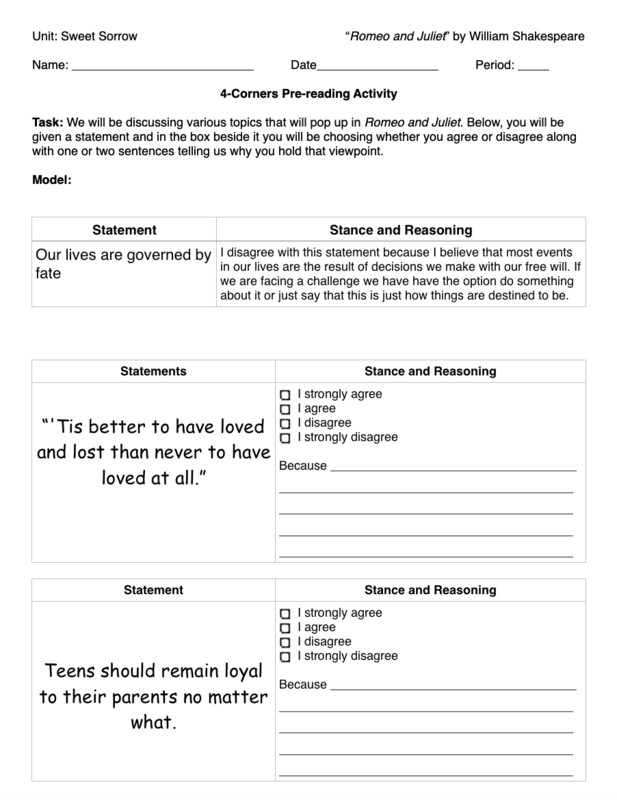 See the The Movie vs. the Play (Romeo and Juliet) handout How can we compare and contrast a modern interpretation of Romeo and Juliet with the original text? MAKE UP OWED HOMEWORK: see previous days' assignments. QUIZ on the Prologue of Romeo and Juliet and Act I, Scene 1 of Romeo and Juliet (read in class). Refer to your class notes and handouts. This was due on MONDAY: Prologue Mini-Essay (read the instructions and follow the format! ): This will be worth THREE HOMEWORK ASSIGNMENTS! You can type (double-spaced, 12 point font, Times New Roman) or hand-write the essay. You must include a proper heading: your name, teachers' names, class name, period and assignment title. You must hand it in! If it's late, it will be half credit! Refer to The Prologue of Romeo and Juliet (with a modern-day translation) to guide you for this essay. LATE HOMEWORK IS HALF CREDIT. This was due YESTERDAY: Prologue Mini-Essay (read the instructions and follow the format! ): This will be worth THREE HOMEWORK ASSIGNMENTS! You can type (double-spaced, 12 point font, Times New Roman) or hand-write the essay. You must include a proper heading: your name, teachers' names, class name, period and assignment title. You must hand it in! If it's late, it will be half credit! Refer to The Prologue of Romeo and Juliet (with a modern-day translation) to guide you for this essay. LATE HOMEWORK IS HALF CREDIT. This was due TODAY: Prologue Mini-Essay (read the instructions and follow the format! ): This will be worth THREE HOMEWORK ASSIGNMENTS! You can type (double-spaced, 12 point font, Times New Roman) or hand-write the essay. You must include a proper heading: your name, teachers' names, class name, period and assignment title. You must hand it in! If it's late, it will be half credit! Refer to The Prologue of Romeo and Juliet (with a modern-day translation) to guide you for this essay. LATE HOMEWORK IS HALF CREDIT. Prologue Mini-Essay (read the instructions and follow the format! ): This will be worth THREE HOMEWORK ASSIGNMENTS! You can type (double-spaced, 12 point font, Times New Roman) or hand-write the essay. You must include a proper heading: your name, teachers' names, class name, period and assignment title. You must hand it in! If it's late, it will be half credit! Refer to The Prologue of Romeo and Juliet (with a modern-day translation) to guide you for this essay. Make up any owed HW (see previous day's assignment). Today's Agenda How can we summarize the main points from the unit on the struggle for survival, focusing on Night and "Is Survival Selfish"? Make up any owed HW (see previous day's assignment). 50 Attitudes of Gratitude: Write a list of 50 things you are grateful for. Here are questions to get you thinking about gratitude: What if someone gave you 1 million dollars in exchange for your eyes? Your hands? Your legs? Your ability to speak? Do you realize what precious, priceless gifts you carry with you every day? Are you grateful for modern medicine, immunizations, clean, drinking water, nutritious food, accessible food, food that you can buy at the grocery store and not hunt or pick with your bare hands? Are you grateful for a roof over your head, clothing to choose from in your closet, pillows, blankets, and a mattress? Are you grateful for heat during the winter, a microwave, an oven, and a freezer? Are you grateful for modern technology, like your cell phone, TV, ipod, dvd's, and internet access? Are you grateful for family, friends, teachers, classmates, free public education, and free speech? Are you grateful for access to shopping malls, movie theaters, beaches, bodegas, and subway stations? Be ready to share and explain your reasons for all that you're grateful for. EXAM on Night and "Is Survival Selfish? ": This will be an open-notes, multiple-choice exam. You will be tested on the following: Night chart, the summary notes on Night, and the summary notes and questions for "Is Survival Selfish?" This will be 50% of the 1st marking period grade. Make sure that you have all of your notes in order so that you can use them for this exam. Tomorrow, WEDNESDAY, FEBRUARY 27th, is the LAST DAY of the 1st marking period! Turn in all owed assignments by TOMORROW IN CLASS ONLY (no work will be accepted after your class period). ***LATE HOMEWORK ASSIGNMENT POLICY: If you turn in a late, informal homework assignment (without a legitimate, approved note from a parent/guardian/doctor), you will automatically earn half-credit. Each homework assignment is worth 10 points, so if it's turned in late (one day, 10 days, 20 days, etc. ), you will earn only 5 points for the assignment. TURN IN WORK ON TIME! Major, formal homework assignments that are 100 points will have -10 points deducted for each day late (without a legitimate, approved note from a parent/guardian/doctor). 1.) How is this article relatable to Night? 2.) How does instinct play a role in tragic events? 3.) What are survivors' reactions during and after tragic events? 4.) Which of the following best expresses the author's claim in the article? A. Survivors are often rightly considered selfish because they put themselves before others in various survival situations. B. Survivors cannot be labeled selfish or not selfish because every survival situation is different. C. Survivors cannot be labeled selfish because to survive you always have to put yourself before others. D. Survivors can be considered selfish because cutting the rope of your friend while rock climbing or abandoning others on a crashed plane are acts of selfishness. 5.) In the final paragraph, the author writes that there is a "fine line between smart and selfish" and that "sometimes there's no line at all." What does she mean by this and how does her conclusion restate her claim? Today's Agenda How does the story Night support the theme of the struggle for survival? Today's Agenda How does the story Night support the theme of the struggle for survival? DUE TOMORROW, WEDNESDAY, FEBRUARY 13th: Creative Writing or Analytical Writing Opportunity on the Struggle for Survival. Choose one. Creative Writing: Choose one sentence from Night (from the textbook) as your first sentence in a creative, fictional story in which you imagine what the Struggle for Survival was like during the Holocaust. Write two handwritten pages (or one, typed, double-spaced page). Show the struggle for survival, using all the senses (sight, sound, touch, smell and taste). Use imagery and other literary techniques (such as similes, metaphors, personification, foreshadowing) and literary elements (conflicts, characters, setting, and plot). You may e-mail me at hconn@schools.nyc.gov. If you type this paper, then you MUST use 12 point font (in Times New Roman), double-spaced, and 1-inch margins. Include your name, the teacher's name, class name, class period, date and title in the heading. Analytical Writing: What is the author's purpose in writing a memoir about the struggle to survive during the Holocaust? Write two handwritten pages (or one, typed, double-spaced page). Explain how and why Elie Wiesel (the author) writes about the struggle for survival. Use textual evidence (at least two quotes from the story) to support his purpose for writing about this struggle. You may include your prior knowledge about other people's struggles for survival (around the world, throughout time, and in your personal life). You may e-mail me at hconn@schools.nyc.gov. If you type this paper, then you MUST use 12 point font (in Times New Roman), double-spaced, and 1-inch margins. Include your name, the teacher's name, class name, class period, date and title in the heading. Today's Agenda How does the story Night support the theme of the struggle for survival? DUE THIS WEDNESDAY, FEBRUARY 13th: Creative Writing or Analytical Writing Opportunity on the Struggle for Survival. Choose one. Why We Remember the Holocaust (a video by the U.S. Holocaust Memorial Museum How can we examine the historical background of the Holocaust? PERIOD 4 ONLY: DUE TOMORROW, FRIDAY, FEBRUARY 8th: Turn in the completed Goal Sheet. QUIZ on Night Vocabulary List. You MUST know the definitions for each vocabulary word and how to compose each word in a sentence. This quiz grade will be 10% of the 1st marking period. Show the completed Goal Sheet by the end of class today to earn class credit! Class Supplies: Bring in a pen, labeled notebook/binder and an English folder. Your notebook/binder must be labeled with the following sections: Do Now's and Aim's (DNA), Literary Analysis (LA), Language Skills (LS), and Homework (HW). Vocabulary Flashcards: Compose flashcards for all of the vocabulary words on the Night Vocabulary List. Create the flashcards on index cards, loose leaf or an electronic device. Write the vocabulary word and part of speech (noun, verb, adjective or adverb) on the front of the card. Write the definition and an original sentence (write your own sentence; don't copy from the sample sentences, internet or another source). *You may use an electronic flashcard app.